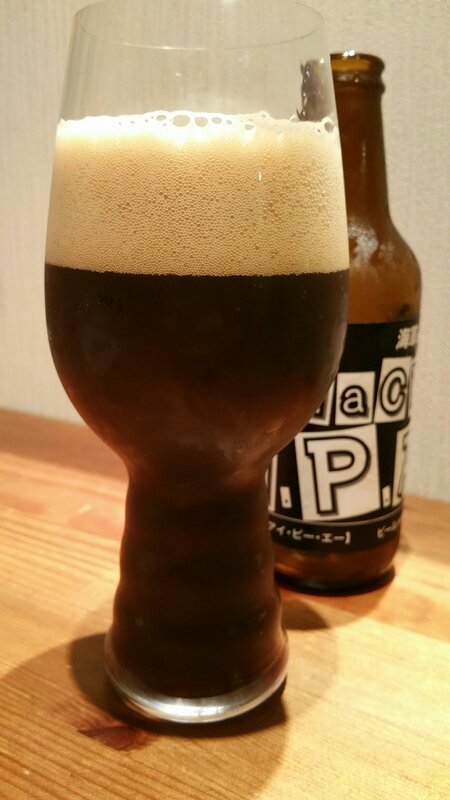 Kure Black IPA is a 4.7% black IPA from Kure Beer, based in Hiroshima, Japan. It was first released in March 2016 and can be found in both bottles and on tap across Japan; however, at the time of writing we’re unsure if it is an actual seasonal beer or an all-year round edition. Kure Black IPA is brewed using 5 different kinds of black malts to enhance the roasted and chocolate flavours the brewers were looking for. Another black IPA turns up on the BeerTengoku review bar with Kure Black IPA, and you know what, I didn’t really want to review it; however, Joe was too far away for me to fob, sorry, pass this off to, so I begrudgingly drank it. Kure Black IPA poured out a pitch black colour with a large frothy white head that should no signs of abating throughout drinking, until towards the end where it left an oily slick on top of the beer. The nose was most peculiar though – I don’t know if you’ve ever eaten a Terry’s Chocolate Orange but Kure Black IPA smelt nigh on identical to it – lashings of chocolate aroma coming off with hints of orange and lemon coming through too, followed with some coffee. Is it a porter? Is it an IPA? Nope, it’s a black IPA – one of the most peculiar beer styles ever made. Drinking Kure Black IPA was a weird experience – it started off with a lemony bitterness but then segued into a roasted coffee and chocolate flavour in the body soon after. It swung quickly between the two throughout drinking – citrus coffee citrus coffee oooh there’s some chocolate and some citrus – you get the picture. Kure Black IPA was also quite dry and disappointingly thin for the flavours going on. It finished up leaving a bitter finish on the palate with a slight acrid black malts flavour. Kure Black IPA is easy-drinking but slightly rough in the end – but it’s still one of the better examples of a black IPA I’ve drunk. And I’m glad I didn’t give it to Joe.